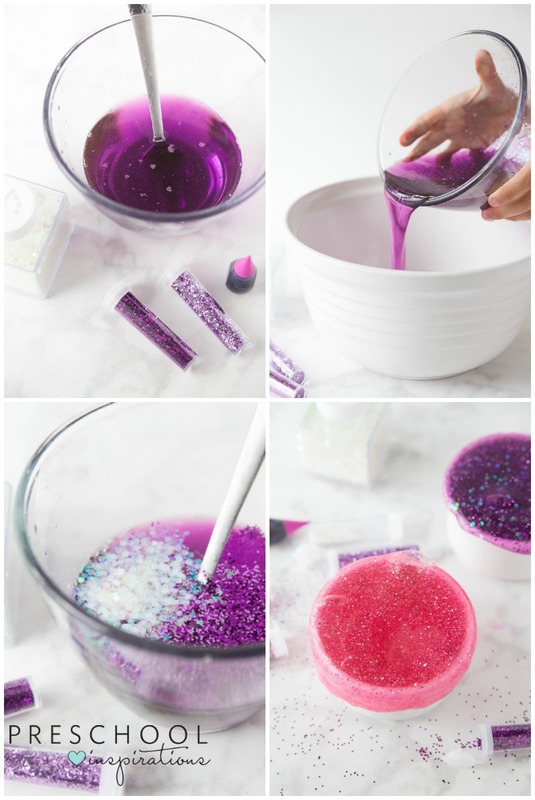 How to Make Gorgeous Glitter Slime! 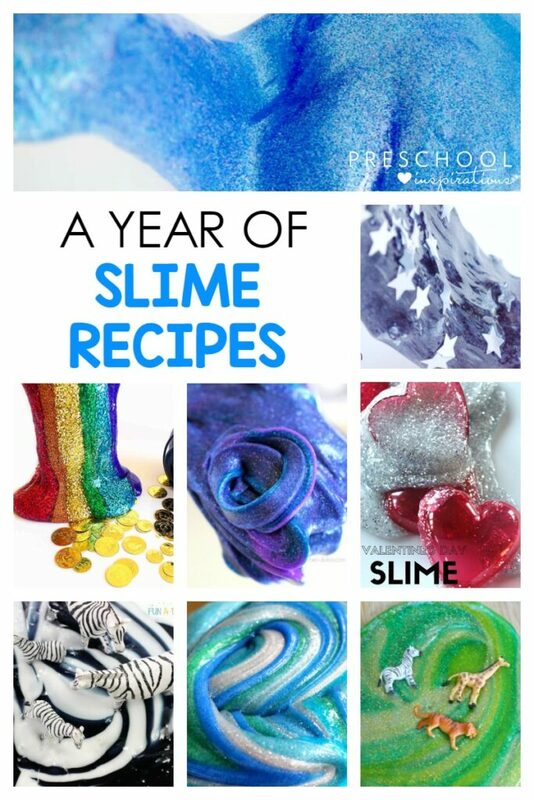 Back by popular demand, here is my slime recipe with a twist! 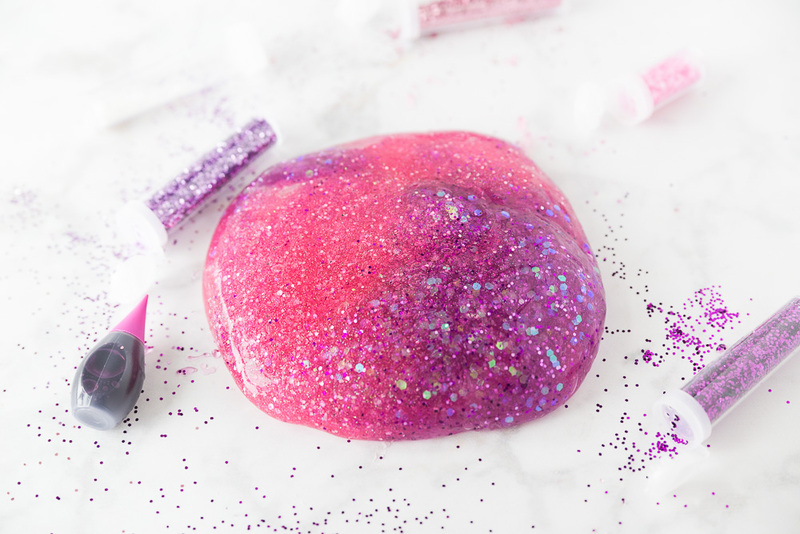 If you are looking for how to make glitter slime, this slime recipe is one that is tried and true! 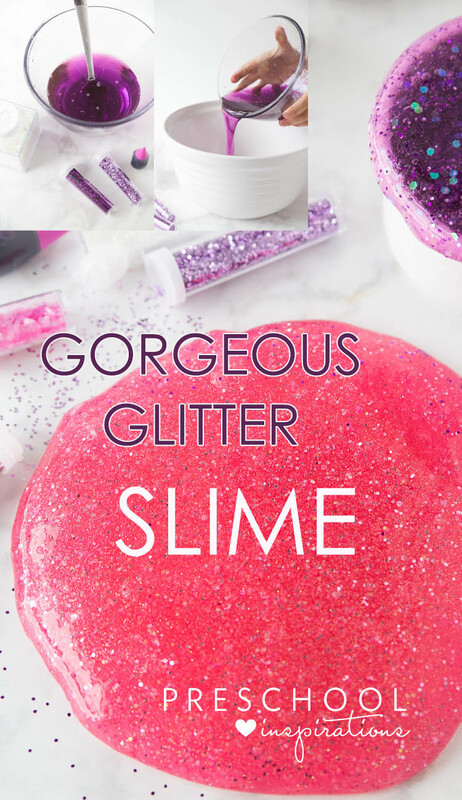 I decided to share my glitter slime recipe for everyone who has loved my perfect slime recipe — the one that I recommend if you’ve had a slime fail! Or if you need to make slime right the first time. If slime has ever gone wrong for you, you will love this recipe because I developed it after hearing about my friends who were having slime fails! Slime can be so tricky! I have figured the main reason that borax slimes go all wrong. If you are not sure about the safety of slime made out of borax, I recommend reading this article about Whether Slime Brings Serious Health Risks. Most of the time that slimes fail is due to the amount of borax. Many recipes call for 1 tsp to 1 Tbsp. While that sounds like a small amount, you don’t even need that much! 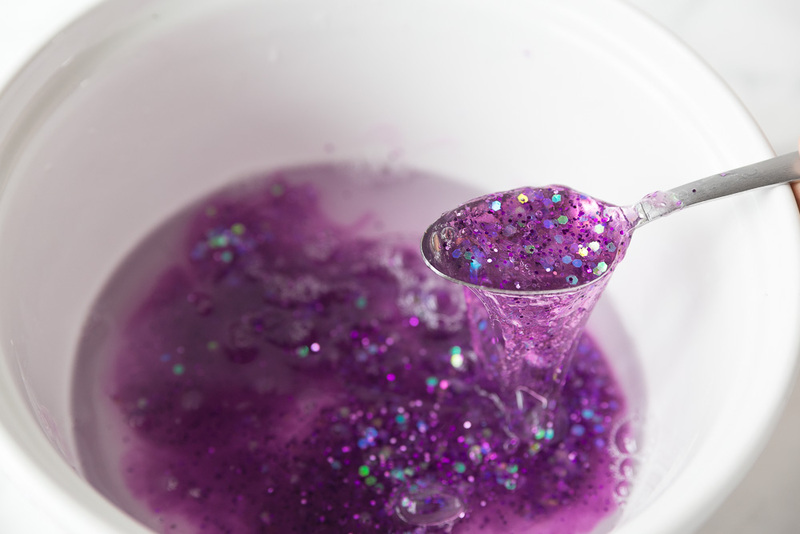 My perfect glitter slime is made with ½ tsp to ¾ tsp of borax. The other big reason that slimes fail is because the ingredients need to be broken down a bit before they are mixed together. One time I skipped putting water into my glue, and my slime turned out so hard. It was awful! I recommend following my instructions for glitter slime very closely, especially if this is your first time or if you have had slimes go wrong in the past. Something that may seem to quicken up the slime process could give you a super rubbery or sticky slime, which is no fun! If any slime gets on clothes or hair, use vinegar to dissolve it! If your slime goes wrong and doesn’t work, read the bottom of my post about how to make perfect slime which explains how to fix slime that is too hard or too stretchy. My favorite slime is made of clear glue or glitter glue (both Elmer’s). You are able to see through the clear glue or glitter glue, but white glue looks more like the substance many of us remember as silly putty. Add a squirt of liquid watercolor or a few drops of food coloring. This is also when you want to stir in any glitter. 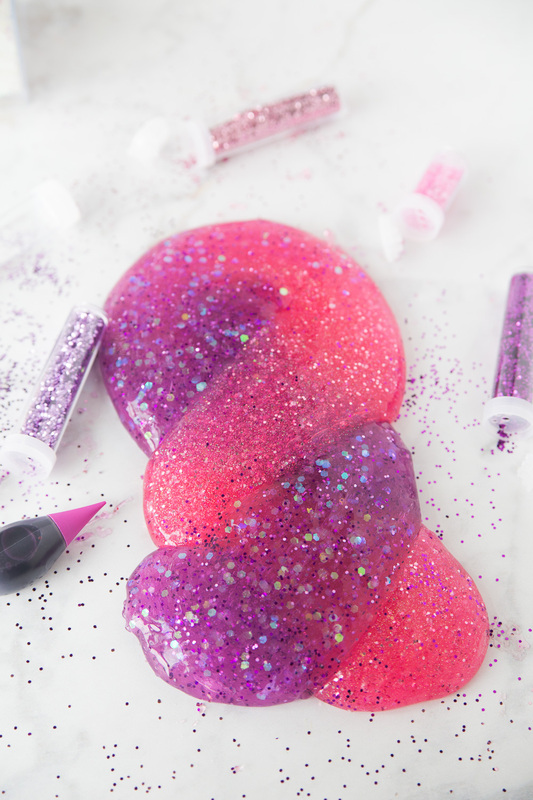 Fine glitter will show up really small and make your slime glisten. Big glitter will add a pop of color and fun. If you use Elmer’s glitter glue, which is already colored, you don’t have to use coloring. But you can add extra if you want more. Now, it’s time to pour your glue mixture into the big bowl with the borax and water mixture. Hopefully, you will have an amazing slime that is perfect to stretch, bend, and mold. If you have any trouble along the way, read the bottom of my post about how to fix slime. Hi!! Thanks so much for fantastic content!! Love it. Quick question about the slime making process, would it be a good idea to use an electric mixer to mix and then later knead the slime? Oh, I love this!! I bet they will have a complete blast. I’ve always wondered if it would work in a baggie, so thank you so much for sharing :).